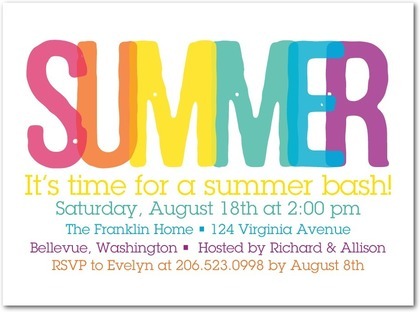 Being Frugal and Making It Work: Tiny Prints Summer Party Invitations Giveaway! 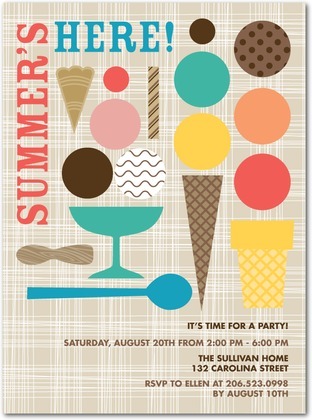 Tiny Prints Summer Party Invitations Giveaway! Summer is my favorite time of the year, warm weather, fun BBQ's, boating and outdoor parties! Are you expecting a summer baby or hosting a baby shower? Are you looking for the perfect party invitations? Baby shower invitations that are fun and unique - not the same invitations that everyone else uses! Babies are one-of-a-kind and celebrations in honor of them should be just as special and unique as they are! While rubber ducks, booties and teddy bears are adorable, why not think outside of the box and send a party invitation that guests will remember! One that they will want to post on their fridge to make sure they don't forget to attend! Whether you're hosting a baby shower, family reunion, summer BBQ, camp out, birthday party or neighborhood block party... Tiny Prints has a fantastic selection of fun, stylish and unique summer party invitations perfect for any celebration! This giveaway will end July 15th at Midnight EST. The giveaway is open to US residents only, 18 years old or older. The winner will be chosen at random via Rafflecopter, and the winner will be notified by e-mail. Make sure to leave your e-mail, or have your contact available on your blogger profile. The winner will have 48 hours to respond, and if there is no response another winner will be chosen. Disclaimer: I will receive complimentary party invitations from Tiny Prints for the purpose of writing a review and hosting a giveaway. Regardless, I only recommend products or services I use personally and/or believe will be a good fit for my readers. The views and opinions expressed on this blog are purely my own. Results may vary. No monetary compensation was received. I like the Cook Out Time & the Another Glowing Year invitations. Thanks for the giveaway! I love the mailed montage, fondest flowchart, chic calendar, distressed frame, chalk frame, umbrella collage, charming teacups, and many more! I just got engaged so these invitations would be perfect whether it’s a save the dates, bridal shower, or wedding invitations! Thank you for giving me the opportunity to enter this giveaway, so sweet of you! Good luck to everyone who enters this giveaway! I like the Aged to Perfection birthday invitation. My favorite design is the Bubbly One: Sea Blue. The Breezy Bliss Light Purple baby shower invitations are my favorite. I love the Birthday Monsters Invitations best. Four AMAZING Giveaways Ending Tonight! I Survived my First Week on Nutrisystem! What is a Diaper Cake? FREE Hazelnut Iced Coffee Keurig K-Cup Pack! Christmas in July - Enter Blog Giveaways! Tips for Changing a Squirmy Baby's Diaper! Zulily - Daily Deals For Moms, Babies and Kids!